Anterior shinsplints can occur if running or jumping on hard surfaces and if walking a long way when you are not used to it. Posterior shinsplints are often caused by overpronating feet, dropped arches, flat feet and running without the correct footwear. Shinsplints are usually tender if you press your thumb up the edge of the shin and will often stop runners from running in its severe form. Overpronating feet or dropped arches can cause shinsplints in runners. Biomechanics play a big part in being able to run long distances like a half marathon or marathon and if you overpronate then you are likely to develop injuries because your biomechanics are not correct. 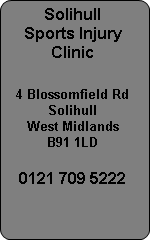 At Solihull Sports Injury Clinic we offer a full biomechanical evaluation with video gait analysis and 3D laser foot scanning. This service can evaluate the need for correction and also determine the style of runner you are. Prescription orthotics can be supplied and fitted for children and adults to correct biomechanical faults and prevent injuries.